Search here in our online offer! Our hand-made glass products glass pens, from strip glass, crystal clear white with pearl green made of Lauschaer glass are very harmoniously and balanced in shape and color design. Wherever they are used are very decorative highlights to the eye of the beholder. They are very popular and always a good gift idea. They are very good in the handling and perfect for calligraphy, drawing, painting with ink, ink and all liquid colors on various materials. Glassblower from Lauscha, original directly from the manufacturer manufactured in Lauscha. 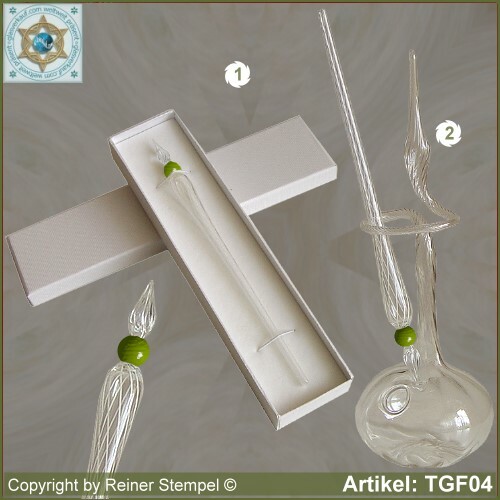 THURINGIAN GLASS, art craft with tradition and future. Always be up to date! Download here our App for your mobile devices! Contact ... It's your turn! Please contact us and let us know your questions, suggestions and opinions knowledge. We think about over the answers and report to as soon as possible, by telephone or via e-mail. Try it - we're sure: it's worth a try!